Neonatal jaundice is a frequent condition in newborns highlighted by the yellowing of the skin and the white part of the eyes (sclera), caused by excessive amount of bilirubin in blood produced by the destruction of red blood cells. In mild or moderate cases, usually the newborn removes the excess bilirubin during the first 2 weeks of life. 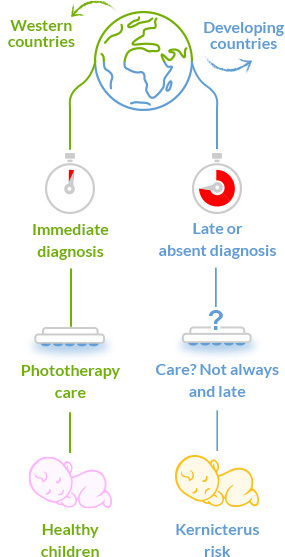 In case of a severe jaundice a phototherapy treatment is crucial. The consequences of high bilirubin levels can be very serious: if not immediately diagnosed, severe jaundice can cause irreversible neurological damages that will last for the whole life of the baby. This serious disease is called Kernicterus and the children who develop it may have: cerebral palsy, mental retardation, loss of motorcycles, hearing loss and, in the most serious cases, death. Every year, 140 million children are born in the world. 60% of term newborn babies (about 85 million) and 80% of preterm newborns develop, between the third and fifth days of life, neonatal jaundice (mild, moderate or severe). The International Guidelines recommend early detection of jaundice by measuring the level of bilirubin within the first 2 weeks to intervene with phototherapy. If severe jaundice is not diagnosed on time and the affected infants are not adequately treated, 10% of them are likely to develop Kernicterus. The problem concerns the whole planet, but the disease mostly affects the countries of the South of the world: Africa, Southeast Asia and South America. 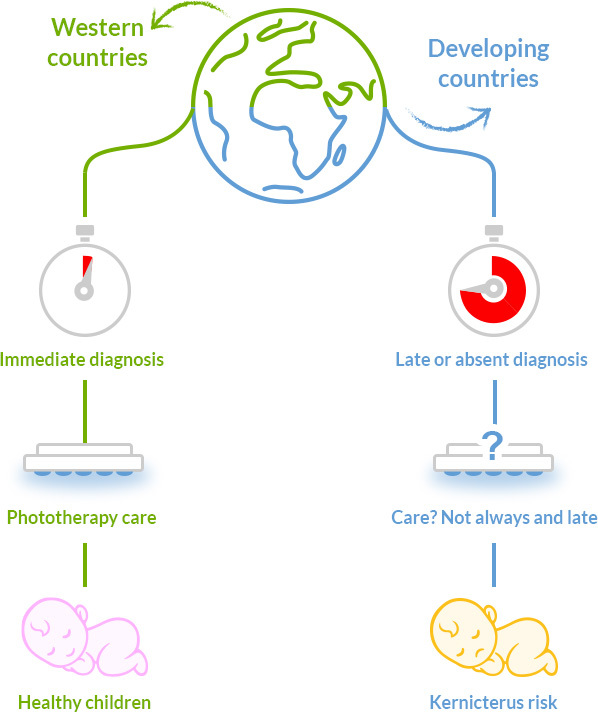 While in the European and Anglo-Saxon countries the diagnosis and treatment of neonatal jaundice is at an excellent level making Kernicterus cases uncommon, in Low-Middle Income Countries, due to the shortage of economic and structural resources, the situation is far more worrying. In these areas, timely intervention should be studied to facilitate diagnosis and therapeutic practices.